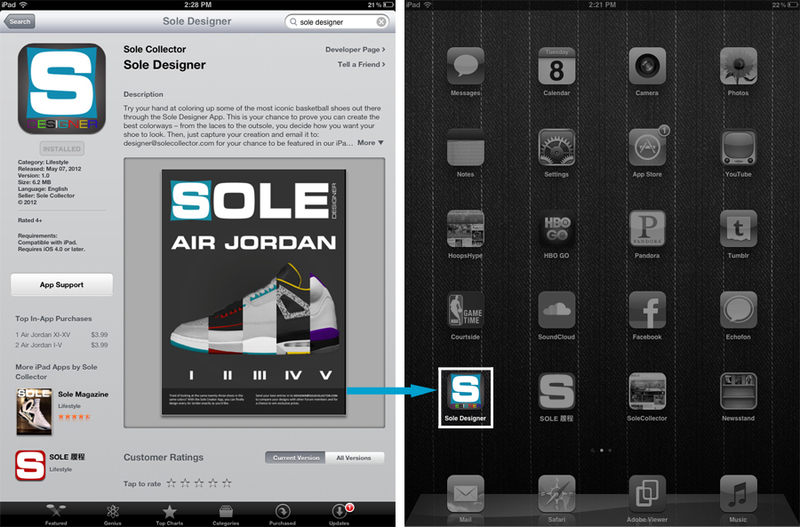 After launching first for the iPad, our "Sole Designer" App is now available on the iPhone for just .99 cents per pack. Find out how you can color up all 23 Jordans ahead. Tired of looking at the same twenty-three shoes in the same colors? With our new Sole Designer iPad & iPhone App, you can finally design every Air Jordan exactly as you'd like. With the touch of a button, you can pick out the upper, the overlay, the outsole and everything in between. You can even color up the III's elephant and the XI's patent leather if you want. Send your best entries in to Designer@SoleCollector.com to compare your designs with other Forum members and for a chance to win exclusive prizes. Sole Designer. Available now on the iPad & iPhone App Store. - Install the App and purchase. Available on iPad for $3.99 and on the iPhone for .99 cents. Be on the lookout for more brands, more models, more textures and more colors soon.